I met with Mountainbikeroamer yesterday to discuss designing bumpers and rock sliders (and a bunch of other stuff) and we both felt that it would be a worthwhile exercise to include the SMB community in this project. Since we are hoping that this will be somewhat of an ideation/brainstorming session feel free to think outside of the box since that's sometimes where innovation comes from. The above stuff are just a few examples of ideas that came up in our brief discussion, so keep them coming. Do you want the bumpers to have integrated tow hitches (actual tow hitches, not accessory hitches)? What about recessed access point for lighting, air outlets and power outlets? I really like the idea of the fold-down brush guard, but I would make sure to design it such that in the folded down position, it would also act as a work platform to stand on. How often have you have do jungle gym gymnastics to work on a van engine? Great ideas Herb......keep 'em coming......the work platform is interesting, especially with lifted vans..I'm 6'1" and can barely see in the engine compartment. I'm 6'1" and can barely see in the engine compartment. Here's where I saw something similar years ago, though this only works on SuperDuty pickups since they have the factory tow hooks that this platform hooks into. Glad to see that there's already interest on these ideas! As boywonder mentioned, we met yesterday for early coffee and had an informal chat around general bumper and accessory design. I'm indeed a professional Industrial/Transportation Designer. So yep -- I'm enthused and game to collaborate and crank out/refine/pursue some solid bumper/slider/rack/storage/accessory ideas with boywonder/Freddy and everyone here -- and make 'em look truly rad. The "flip down brush guard/bike and MX rack" idea is one that I've been kicking around for a couple years, and it seemed like a natural one to share with boywonder yesterday as we kicked around what might be truly unique and worth pursuing. It was borne of my frustration with realizing that the front of the van is a great place to store bikes (with front-hitch-mounted fold-down, hitch-mounted bike racks like the Yakima Holdup), but that on bouncy off-road runs, the racks just aren't up to the task of securing bikes well. So (as has already been getting discussed since boywonder got this going already today) ---- I've always thought: why not design a rad-looking brush guard that just also happens to be a fold-down (and bomb-proof) bike/MX/customizable storage tray? No reason an entire assembly like this example (below) couldn't pivot forward 90 degrees and create the kind of customizable-function storage platform that sounds like already appeals to a number of people here. I did a bit of digging around late last night and found the following image of what appears to be a home-brew flipdown brush guard/storage tray idea, but so far haven't seen it anywhere else. Totally digging on the idea of this great forum community being activated to enthusiastically "crowd source" and prove out the best ideas for these bumpers/racks/accessories. Already off to a great start! MountainBikeRoamer, given your professional background, perhaps you could answer a question that I have wondered about for quite some time. One of the things that I hear from aftermarket/upfitting companies such as SMB, Aluminess, and Quadvan is that they go through extensive testing and regulatory compliance procedures to validate their designs and assemblies. For example, SMB claims that for their poptop installation design went through review and approval by Ford and DOT--and as part of gaining those approvals, they had to design stiffening assemblies around the opening, and show that the combination of opening and stiffeners left the van with greater structural integrity than it had prior to cutting the hole. 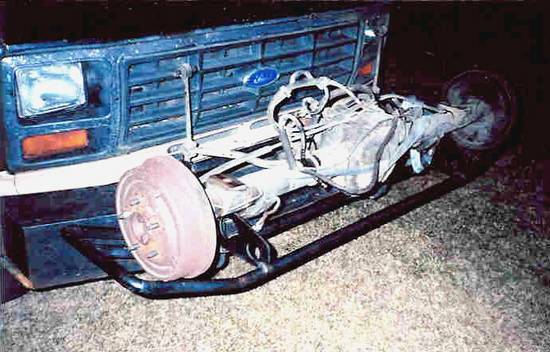 Another example: Quadvan claims that their 4WD conversion goes through ongoing review with Ford to ensure that their entire assembly is fully compatible with the original Ford crumple zone sequence, which includes the process by which the frame members collapse and twist--aided and abetted by the cross member design--to absorb impact and drop the engine and transmission down below the floor of the van in a front-end collision. Aluminess bumpers, I have been told, are also designed to work hand-in-hand with that same crumple zone sequence. SMB and QV jointly paid for testing and validation of replacement fuel tanks for their 4WD conversions. All of this requires careful design and a lot of destructive testing. How do things like this play out with respect to a group of friends designing a bumper--such as is being discussed in this thread? Is it possible to cook up a bumper design that will fully support the original impact response system built into the van by Ford? If so, how does the new design get validated? If not, what are the potential risks and ramifications--both for the designers and for the end users--of doing a non-compliant design? For example, in the event of an accident, is the crumple zone going to work correctly? Are occupants under greater risk of injury? 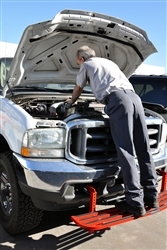 Will an insurance company refuse to pay for the vehicle or for medical care because the owner negatively impacted the vehicle's safety systems by installing a non-validated bumper? Bottom line: I love the ideas I am reading in this thread so far. I am eventually going to put new bumpers on my van, and--while I like the Aluminess offerings--I do believe it is quite possible to improve on their designs. 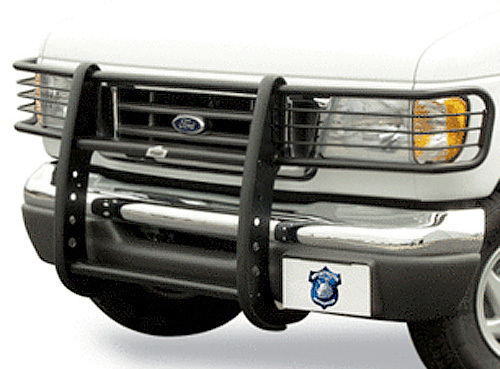 The flip-down brush guard idea is awesome. Designing swing arms on the back in such a way that they do not restrict the opening angle of the back doors would be great. Waterproof storage would be wonderful. I think there is a lot that can be done to make some pretty fabulous bumpers, and I would happily put those bumpers on my rig--but I do want to be clear about the implications of doing so with respect to vehicular safety and overall risk management. Not to overthink things or be the Debbie Downer in the crowd, but my profession keeps me very aware of risk management, and very aware of what can go wrong when potential risks are not identified and addressed in advance. Thus, my questions. I'd love your thoughts. Thanks. Boywonder and I touched on this briefly yesterday, and I can try (edit: ok, I failed, haha!) to keep my answer brief until he gets the opportunity to speak to this here. Long and short, it sounds as if (for Federal Safety regulations anyway) --- light trucks/vans are somewhat exempt from restrictions (and crash/safety testing requirements) surrounding aftermarket bumpers and accessories. Since I work for an OEM, all the accessories we design and offer through the dealership networks are indeed subject to pretty exhaustive safety testing considerations. The aftermarket operates in a somewhat unique fashion, and I'll admit I'm not entirely versed in how liability is managed (apart from forming an LLC). I've always been truly curious (read:skeptical) as to the actual validity of Sportsmobiles claims that their penthouse roofs are stronger (and "safer" in a rollover or crash) than an un-cut original Econoline. I picture latches breaking loose and fiberglass/strut rods/springs/nuts/bolts breaking loose spectacularly.....but I'm no crash test engineer. And surely some SMB's have crashed magnificently enough by now to cause their owners to sue Sportsmobile Corporation....yet they seem to be doing fine. Perhaps there are liability waivers or fine print included in the pieces of paper that ship with all of these fine aftermarket bumpers? One thing I'm facing right now is I have power sources at the front and rear for a winch in a cradle that I can move from front to rear receivers. I would love some way to have the winch still in the bumper and hidden but be able to un pin it and use it in the rear bumper. In its cradle form I really don't like it out in the open all the time, sticking out, begging someone to steal it. I use a winch so infrequently , but at the same time want to be ready for anything. Ya I know, very unrealistic but it's something I always think about. A simpler idea, how about making a stand alone rear tire carrier similar to what Aluminess has only with better latches and stronger attachments. This would be great for those who don't need/want a full bumper. Possibly left and right swing arms.